Large eras in human history have been defined by the tools we used during the era, i.e. the Stone Age, the Bronze Age, the Iron Age and the Industrial Age. The moon exploration conducted by the U.S. Space Program catapulted the human race into the Technology Age. Computers and technology are now our tools. The journey to the moon and what was developed in order to get there and back safely has dramatically changed history. This was the true benefit of the space program. The important point is that the people developing space technology in the 1960s could not have imagined that their efforts to miniaturize electronics would lead to inventions such as the iPhone or iPad. As a result, there is now hand-held, affordable computer technology in most households today, technology that has changed our lives. Such advances were beyond their comprehension in the 1960s. Similarly, we have no idea what will ultimately be developed if we make space travel practical. What is certain is that dramatic advances will ensue if reaching orbit becomes easy, safe and affordable. The bottom line is that we can’t envision the dramatic changes that will occur if we made space travel practical, only that they will occur. Ruling out a renewed space effort because we can’t imagine where it will lead us is a failure in forward thinking. Once low cost travel to space is possible, it is certain we will find many new applications for this technology. The result, a new booming economy will develop. Hopefully, just like the domestic aircraft industry has boosted our economy. The cancellation of the Space Shuttle program and turning-over space launch vehicles to private industry provides an opportunity to advance technological development and thus provide another boost for the U.S. economy. The book “What If We Made Space Travel Practical?” examines the opportunities this new era presents. Please check out www.StarHorseProject.com to understand more. Read How the Space Program Spurred Our Economy Part I published on July 15, 2013. “Why go into space?” is a common question that many people ask. Many skeptics asked, “What value there was in bringing moon rocks back to earth?” The question shows they missed the true benefit we gained from the space program. Retrieving moon rocks may have been a trivial event in history to all but geologists and astronomers. But the journey to the moon and what was developed in order to get there and back safely has dramatically changed history. This was the true benefit of the space program. It’s not the destination that’s important—it’s the journey. The technology that was developed in order to reach the moon was then further developed to produce dramatic, technologically advanced, consumer and business tools. The quest for the moon rocks has created a vast array of tools that have changed society—its pace and how it qualitatively operates today. Before the space race, the use of transistors was in its infancy. Existing electronic technology employed vacuum tube circuits that were too heavy and too delicate to handle the demands of space travel. Of necessity, they were replaced by transistors and solid-state electronics, a newer technology that was there, waiting in the wings and ready to explode in usage and growth. They just needed the right door to enter through. Demands for increasingly complex circuits continued, and obligingly, these transistors were grouped together into integrated circuits, further reducing weight, size and power usage while increasing functionality. As the demands for onboard automatic controllers and computers increased, these integrated circuits evolved in further complexity and were ultimately combined into microchip computers. The space program (and related military missile programs) forced electronic miniaturization which, in turn, inspired further advances in electronics and birthed an amazing and expansive industry. The burgeoning electronic industry then reapplied the technology developed from the space program into more terrestrial pursuits, like portable transistorized radios, solid-state televisions, the mini-computer and then the home computer. When IBM first introduced the home computer in 1981, many could not imagine why anyone would need a computer at home. Find information more on wesbite best rechargeable water flosser. That quickly changed as simple and highly useful programs, applications, games and other entertainment and communication functions were added to make home computers an indispensable part of our personal and professional lives today. Now we feel the need to carry these computers with us everywhere in the form of smart phones, laptops and tablets. Most of us sit in front of a computer at work. The “tool” of our era is technology. The human race has transitioned from the Industrial Age into the Technology Age in an extraordinarily short period of time. Few of us understand the pivotal role the space program had in propelling this transition. Watch for Part II to be published on July 22, 2013. I feel cheated about space travel. I got bamboozled! This blog is for all the dreamers who imagined a future that included regular and frequent space travel — for the dreamers who got bamboozled by the broken promise of a space-age future. I have always been possessed with the idea of space flight. As a child, I didn’t play with fire trucks, blocks or normal childhood toys. I pretended that I was a NASA Mission Control engineer. Or better still, I pretended that I was an astronaut on a space mission. My eyes were on the sky, not the sandlot. My obsession was not a phase―it persisted throughout my youth and my adult life. I studied and read everything I could about space and space travel. I paid enormous attention to the NASA missions to the moon and I fully believed it was just the start of a bigger space program to follow. My exuberant beliefs were nourished by Walter Cronkite’s TV reporting of space missions, excitedly telling us how important these events were, and how the future would be changed by the dawning of the “space-age” we were witnessing. In 1967 through 1970, I watched every episode of Walter Cronkite’s “The 21st Century” on CBS. This program postulated the advances the next century would bring, due to all the rapid technological changes occurring at the time. The space-age future did indeed look bright. You may also be interested in best external protein skimmer. I watched episodes of “Star Trek,” the 1966-1969 NBC series, which further stoked my beliefs in the coming space-age evolution. By1970, after the moon landing, it was obvious for me and many others of my era, that we would have colonies on the moon and be commonly traveling to Mars by the turn of the century. I didn’t just dream about the future, I worked hard to become part of that hi-tech, space-age future by obtaining three engineering degrees. My first professional engineering job was at NASA in 1975. However, I quickly learned that NASA was no longer the rapid incubator of creative thinking as it was in the early 1960s. Instead, it was a bureaucratic place, undergoing staff reductions, where concern for keeping your job was paramount—not advancing space-age technology. “The Right Stuff” had left NASA. My ideas about an efficient space launch vehicle were ignored. Although I quickly learned that my dream of working at NASA was a misguided goal, I still remained hopeful that the coming Space Shuttle program would re-ignite my shining dream of the future. It was not to be. The technical failures of the Shuttle lead to declining interest in space, declining budgets, and placed my dreams in a deep freeze. Now, in the second decade of the new century, I feel cheated that the space-age dreams of my youth are unfulfilled. I got bamboozled! All the dreamers of my era got cheated. However, the heat from a new light shining on the subject may thaw out my frozen dreams. Now NASA and other satellite users are embracing private industry for launching their payloads into space. Now, my decades-long dream of an efficient, low-cost launch system has a better chance of getting implemented than during the bureaucratic, government operated era. Maybe the dreams of my youth will still come true. Please check out the web site www.StarHorseProject.com in order to understand more about making space travel practical. To put it simply: our current space program has lost its mojo―it is simply a refinement of what was done before. Few seem to be interested in re-examining what can be accomplished. Rather, we only seem interested in making small, low-risk improvements to previous technology—yesteryear’s, not tomorrow’s, or even today’s. Our approach to going into space has barely changed since the initial design decisions were made in the 1950s and 1960s. The decisions, made during the Cold War era, were based on proving to the Russians that our rockets could reliably destroy Russian targets and thus provide a deterrent. The exploration of space was only a subterfuge. Our manned space program had to use the same propulsion system as our military system in order to prove to the Russians that our systems were effective. The design decisions shaping the U.S. space program scarcely considered making the program practical, economical or low cost. It didn’t matter how much the rocket cost if it prevented a Russian nuclear bomb from reaching our shores. Why do we continue to make only small incremental improvements to a fundamentally non-practical launch system? Rockets are not the only way to get into space. However, traditional rockets are the common item people imagine when they think of space travel. Rockets have been ingrained in our psyche as the method to get into space since the early days of science fiction. “What if” we consider and examine all methods to get into LEO? Would we still select traditional rockets to get into space? Have science and technology advanced enough since we selected rockets in the 1950s to allow better choices than rockets today? We owe it to our future to reexamine the choices made in the past and to determine if a new, more practical solution is possible. Let’s rethink space travel. 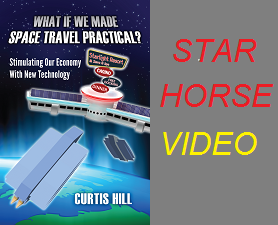 The book “What If We Made Space Travel Practical?” dives into this topic at length. Learn more by examining the website www.StarHorseProject.com.